MetalRockNews: Ghost's Nameless Ghoul: "I've always wanted us to become a full-production band"
Ghost's Nameless Ghoul: "I've always wanted us to become a full-production band"
One of Ghost's Nameless Ghouls was recently interviewed by WNOR FM99, you can read some excerpts below. 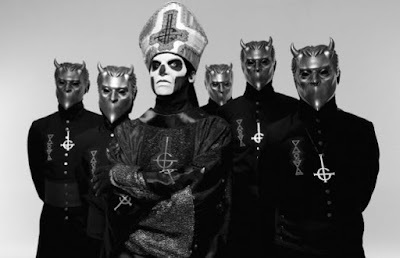 Asked how big he envisions Ghost one day becoming, the Nameless Ghoul said: "It's hard to fully set a parameter of, 'This is exactly how big we wanna become.' But I think that the one goal that we want to achieve… I mean, set aside a lot of the personal, I guess, monetary things that you want to achieve as a human being; you wanna be rich and you wanna be that… But when it comes to the size that I've always wanted us to become or turn into, it's basically a full-production band that can do almost anything that we need in order to fully accomplish the show that we've always had in mind. Obviously, it's not exactly the same vision from eight years ago — it's grown — but the idea has always been for it to be a full-production arena [show]."